Okay... if you aren't a dog lover, you aren't going to drool over our tail wagging wedding ideas for pooches, so you may as well stop reading and move on to a different article that won't leave dog hair on your trousers. BUT ... for those of us who LOVE our slobbering pooches, share our beds with these furry "babies", and wouldn't even THINK about getting married without our best canine friend by our side, READ ON! You should also make an honest assesment of your dog's behavior and coping skills. 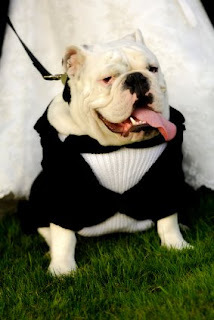 If "Fido" isn't extremely well-behaved, well-trained, used to large crowds, and a relative non-barker, you should consider leaving him at home for the actual ceremony/reception and only involving him in engagement photos and pre-wedding festivities. After all, if your "baby" is stressed out and acting up, it won't be a pleasant experience for anyone.